On the 6th of May, 1973, in a paper curiously and paradoxically titled, “The Strength of Weak Ties”, American sociologist and Professor at Stanford University, Mark Granovetter revealed the proposition that acquaintances are likely to be more influential than close friends, particularly in social networks. Weak ties as he called them, were more likely to connect social networks and also act as bridges. This research paper did more than just pique the interest of its readers or merely arouse their curiosity. As of November 2018, according to Google Scholar, “The Strength of Weak Ties” boasts a jaw dropping 50,000 citations, making it the most cited work in the Social Sciences. So what exactly are these weak ties and how best can we exploit them to further both our personal and professional prospects? Is there an overlap between personal and professional ties? These are some of the key questions which David Burkus grapples with in his extremely readable, evocative and essential book, “Friend of a Friend of a Friend….” (“the book”). The most fascinating aspect of this ‘antithetical’ or even heretical work is the plethora of real life examples embedded between its covers. Burkus embarks on an assiduous story telling saga as he brings together personalities and events spanning a variety of disciplines. From how Michelle McKenna-Doyle, SVP, and CIO of the NFL became – the SVP and CIO of the NFL to how the prolific movie producer Brian Grazer tapped into his weak ties to become the man who gave the world, indelible movies such as Apollo 13, Liar Liar, A Beautiful Mind, and 8 Mile, Mr. Burkus highlights the importance of striking conversations with people with whom one may have hardly interacted. Every Chapter in the book ends with a pragmatic “From Science to Practice” summary where he highlights key tasks for his readers to strengthen and build upon their weak ties. He also provides links to online resources for honing and practicing the skills required to improve upon building up one’s weak ties. 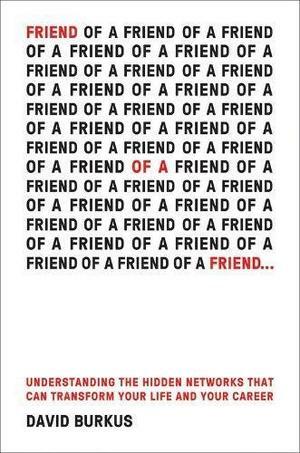 One would do well to push aside the tried and tested Rolodex and instead pick up “Friend of a Friend” by Davis Burkus instead. When did you say was the last time that you interacted with the buddy with whom you shared your dorm room while at the University?